Applied Commerce Education: To be used only by schools providing programming in the area of Applied Commerce Education. Human Ecology/Industrial Arts: To be used only by schools with facilities established by Manitoba Education and Training. Technical-Vocational: To be used only by schools with an approved Senior Years Technology Education Program cluster. High School Apprenticeship Option: To be used only by schools that have documentation that has been approved by the Apprenticeship Branch. NOTE: Please be sure you are using the correct Subject Table Handbook for data submission. Student Marks for June 2019 – use the Subject Table Handbook 2018-2019. 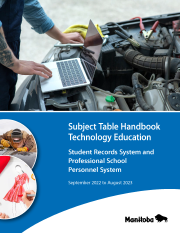 Teacher workload for September 2019 – use Subject Table Handbook 2019-2020.